Dalat is no longer a strange name to most of Vietnamese people as well as foreigners thanks to its charming beauty and amazing landscape together with the wonderful weather. If you have once visited Dalat, you would not be forget that driving along Highway 20 through majestic Prenn Pass and Datanla Waterfall, then turning to the left about 1km across the untouched pine forests, you will encounter turquoise Tuyen Lam Lake, a truly attractive masterpiece of Dalat. Perhaps its popularity is partly from the contribution of Truc Lam Monastery, an antique religious architecture in the area of the lake. It’s no doubt that tourists will definitely experience serene moments of mind in place of pure nothingness one arriving the great monastery. To reach the Monastery, tourists have to run right onto a zigzagging road at the mountain side to Phoenix Summit, on which stands beautiful famous Truc Lam Zen Monastery in an open poetic natural environment. Along with Truc Lam Yen Tu in Quang Ninh province, Truc Lam Tay Thien Phuc in Vinh Phuc province, Truc Lam Monastery Dalat is one of the three largest Zen monasteries in Vietnam. 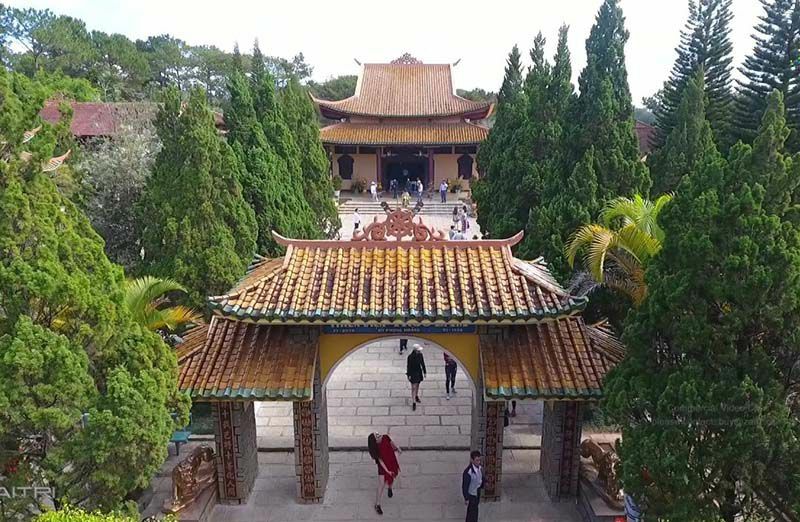 Dating back to the historical explanation, it was established in special social conditions, with the aim of restoring Truc Lam Yen Tu Zen School founded by the King Tran Thanh Tong, this Zen school has harmoniously combined different Zen schools with Vietnamese cultural and tradition into Vietnamese Zen. Truc Lam Zen Monastery lies on a protected forest of 23,2 hectares, of which 2 hectares is the building area. Going on to the modern time, Truc Lam Zen Monastery was designed in a new way with the oriental architecture style. Built in 1993-1994 by superior Buddhist monk Thich Thanh Tu, thanks to the beautiful landscapes, the pagoda is not only a place for meditation but also an ideal place for visiting. Mediation has been by far such a good and healthy way to balance people physically and mentally. As being a meditation center, its main purpose is to help people live in “full awareness” and bring their souls back into peaceful state. Truc Lam Buddhist Zen emphasizes on every one’s interior concentration, either a religious or someone in his/her family. This introspective soul training process leads to personal purification, builds a care-free mind and help one’s good nature to show up; this is the real peace in everyone’s interior, not in a certain paradise in a faraway world. Deepening and harmonizing into the nature and you would feel a cool and fresh air coming into to soul and body. Not only is it a unique architectural works adjacent Tuyen Lam Lake, but Truc Lam Monastery also is an impressive tourist Dalat attractions. Going up from Tuyen Lam Lake is a 140 stone step steep path with towering pine groves leading through 3 three-entrance gates to enter the sanctum. The sanctum area owns an area of 192 m2 with simple architecture but retaining deep significance of the Buddha. The center of the sanctum is the Buddhist statue of Shakyamuni 2m high with right hand holding lotus flower. The right of the Buddha is Bodhisattva Manjushri riding a lion. The left is the Bodhisattva Samantabhadra riding white elephant. Surrounding the holy sanctum are bas-reliefs meticulously carved. It can be said that the monastery’s flower garden is one of the sites tourist cannot miss when setting foot on Truc Lam Monastery. It is also the rare flower garden housing the great number of strange and precious flowers. Varieties of flowers were planted by monks and nuns here. Unlike other Dalat pagodas, Truc Lam Pagoda also retains a nursery and transplant garden. It is a home to many kinds of flowers over the world. The most famous is species of purple myrtle, Australia kapok or confederate rose… Tourists seemly are lost in a world of flowers when arriving here. Immersing in a peaceful and gorgeous scenery, tourists seem to forget the noise and bustle of urban life in order to soak up with the nature, the earth and sky instead. 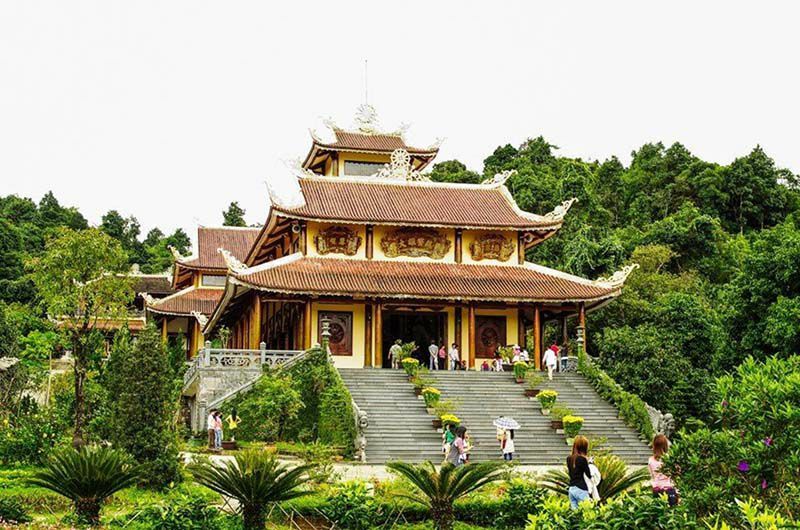 If you have been fully tired of your entire busy life with too much stress and you really seek for a place where you can find the balance in life, Thien Vien Monastery will be a perfect choice for you. You can have meditation, you can watch the sightseeing and you can feel peaceful in your mind. 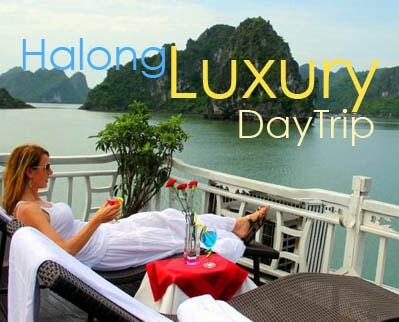 Just spend a sum of time covered by this wonderful and amazing place and you would find how worth it is in your trip list!